Prince Yarvi has vowed to regain a throne he never wanted. But first he must survive cruelty, chains, and the bitter waters of the Shattered Sea. And he must do it all with only one good hand. The deceived will become the deceiver. Born a weakling in the eyes of his father, Yarvi is alone in a world where a strong arm and a cold heart rule. He cannot grip a shield or swing an axe, so he must sharpen his mind to a deadly edge. The betrayed will become the betrayer. Gathering a strange fellowship of the outcast and the lost, he finds they can do more to help him become the man he needs to be than any court of nobles could. Will the usurped become the usurper? But even with loyal friends at his side, Yarvi finds his path may end as it began—in twists, and traps, and tragedy. Prince Yarvi is a peacekeeper, not a fighter and certainly not a king. Yarvi has made his peace with this. That is he made his peace with this decision until his father and brother are killed and suddenly Yarvi is next in line for the throne. As a young man who does not cherish fighting and is missing several fingers on one hand (thus the Half a King reference), people are not too excited about their new leader. Unfortunately for Yarvi, this lack of excitement leads to a very quick coupe and a life of servitude for Yarvi. I started The First Law trilogy a few years ago, but I never finished it because I kept getting distracted by other things. Although I didn't buckle down and finish the series, I did love the gritty world that Abercrombie created. The First Law was dark, violent, and the very opposite of everything that I knew when it came to the world of fantasy. When I first heard about Half a King, I had to wonder if Abercrombie could pull off gritty in the YA world. The answer is yes, Abercrombie can. Abercrombie does not pull any punches in Half a King, Yarvi's world is crummy and Yarvi does not fair too well. Are the violent scenes super gritty and is the cursing over the top? No, this is a YA novel; however, I never found myself desiring more darkness. The story is gritty with limited hope. Half a King is a completely different type of YA novel. We have a male protagonist in a dark fantasy realm. Abercrombie does to YA fantasy what Suzanne Collins did to YA SF (yep, I am going to argue that The Hunger Games is SF for this situation). Yarvi is a fascinating protagonist who we see grow over the course of Half a King. We get to see Yarvi use both his cleverness and his hands to achieve both successes and disasters. I was quite pleased to see that Yarvi was not "overly clever." I do hate seeing teenage YA protagonists being more clever than everyone in the room. Yes, teenagers have their moments of brilliance, but they are never always the most clever people in the room. 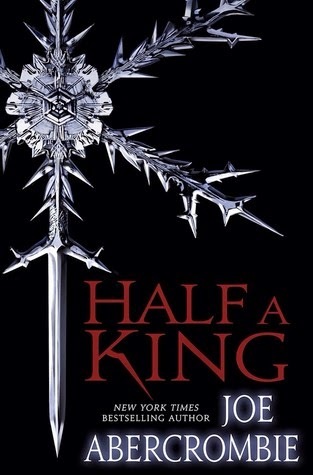 Although Half a King is supposed to be book one in a trilogy (I think it is a trilogy anyway), you can read this book as a stand alone. The book ends with a satisfactory ending. I give Abercrombie bonus points for this, because many first books in trilogies are starting to end with cliffhangers. I hate this so much! I have to tell you that I could not stop reading this book once I got into it. The pages just flew by. There was just so much action and adventure jam packed onto each page. I guess my one main complaint is that there were wasn't a ton of world building, because the book's focus was on adventure. Overall, Half a King was a fun adventure. This book makes me want to read more YA and Abercrombie, so I think Abercrombie did his job.